This article is about the biblical figure. For the other Job figures, see Job (disambiguation). 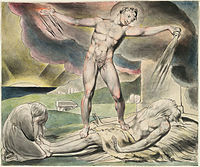 Job (/dʒoʊb/ JOHB; Hebrew: אִיּוֹב, Modern: Iyyov, Tiberian: ʾIyyôḇ) is the central figure of the Book of Job in the Bible. In rabbinical literature, Iyov (אִיּוֹב) is called one of the prophets of the Gentiles. In Islam, Job (Arabic: أيّوب‎, translit. Ayyūb) is considered a prophet. Job is presented as a good and prosperous family man who is beset by Satan with God's permission with horrendous disasters that take away all that he holds dear, including his offspring, his health, and his property. He struggles to understand his situation and begins a search for the answers to his difficulties. The Hebrew Book of Job (/dʒoʊb/; Hebrew: אִיוֹב Iyov) is part of Ketuvim ("Writings") of the Jewish Bible. Not much is known about Job based on the Masoretic text of the Jewish Bible. The characters in the Book of Job consist of Job, his wife, his three friends (Bildad, Eliphaz, and Zophar), a man named Elihu, God, and angels. It begins with an introduction to Job's character—he is described as a blessed man who lives righteously in the Land of Uz. The Lord's praise of Job prompts an angel with the title of 'satan' ("accuser") to suggest that Job served God simply because God protected him. God removes Job's protection, and gives permission to the angel to take his wealth, his children, and his physical health (but not his life). Despite his difficult circumstances, he does not curse God, but rather curses the day of his birth. And although he anguishes over his plight, he stops short of accusing God of injustice. Job's miserable earthly condition is simply God's will. In the following, Job debates three friends concerning Job's condition. They argue whether it was justified, and they debate solutions to his problems. Job ultimately condemns all their counsel, beliefs, and critiques of him as false. God then appears to Job and his friends out of a whirlwind, not answering Job's central questions. Job, by staying silent before God, stresses the point that he understands that his affliction is God's will even though he despairs at not knowing why. Job appears faithful without direct knowledge of God and without demands for special attention from God, even for a cause that all others would declare to be just. And the text gives an allusion to Job 28:28 "And unto man he said, Behold, the fear of the Lord, that is wisdom; and to depart from evil is understanding". God rebukes the three friends and gives them instruction for remission of sin, followed by Job being restored to an even better condition than his former wealthy state. Job 42:10–17 Job is blessed to have seven sons, and three daughters named Jemimah (which means "dove"), Keziah ("cinnamon"), and Keren-happuch ("horn of eye-makeup"). His daughters were said to be the most beautiful women in the land. The Septuagint, an ancient Greek translation of the Hebrew Old Testament, has a revised and updated final verse that claims Job's genealogy, asserting him to be a grandson of Esau and a ruler of Edom. This man is described in the Syriac book as living in the land of Ausis, on the borders of Idumea and Arabia: and his name before was Jobab; and having taken an Arabian wife, he begot a son whose name was Ennon. And he himself was the son of his father Zare, one of the sons of Esau, and of his mother Bosorrha, so that he was the fifth from Abraam. And these were the kings who reigned in Edom, which country he also ruled over: first, Balac, the son of Beor, and the name of his city was Dennaba: but after Balac, Jobab, who is called Job, and after him Asom, who was governor out of the country of Thaeman: and after him Adad, the son of Barad, who destroyed Madiam in the plain of Moab; and the name of his city was Gethaim. And his friends who came to him were Eliphaz, of the children of Esau, king of the Thaemanites, Baldad sovereign of the Sauchaeans, Sophar king of the Minaeans. He is mentioned in the Book of Ezekiel. He is cited as someone "who held fast to all the ways of justice" in the deuterocanonical Sirach. He is praised for his perseverance in the Christian Epistle of James. He is the protagonist of a pseudepigraphal book called the Testament of Job. He is also mentioned in the Doctrine and Covenants, one of the four sacred texts of The Church of Jesus Christ of Latter-day Saints (LDS Church). He is discussed as a prophet in the Quran. In the Bahá'í writings: A lengthy tablet was written by Bahá'u'lláh, the first part of which is focused on Job. The Tablet is often referred to as the Tablet of Patience or the Tablet of Job. A clear majority of rabbis saw Job as having in fact existed as a historically factual figure. According to a minority view, Job never existed. In this view, Job was a literary creation by a prophet who used this form of writing to convey a divine message. On the other hand, the Talmud (in Tractate Baba Batra 15a–16b) goes to great lengths trying to ascertain when Job actually lived, citing many opinions and interpretations by the leading sages. Job's resignation to his fate. When Job was prosperous, anyone who associated with him even to buy from him or sell to him, was blessed. David, Job and Ezekiel described the Torah's length without putting a number to it. Job was in fact one of three advisors that Pharaoh consulted, prior to taking action against the increasingly multiplying Israelites in the Book of Exodus. As described in the Talmud: Balaam urged Pharaoh to kill the Hebrew new-born boys; Jethro opposed this decree; and Job, though personally opposed to the decree, kept silent and did not protest it. It is for Job's silence that God subsequently punishes him with his bitter afflictions. However, the Book of Job itself contains no indication of this, and to the prophet Ezekiel, Yahweh refers to Job as a righteous man of the same calibre as Noah and Daniel. 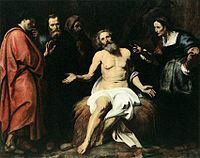 Christianity accepts the Book of Job as canon in its Old Testament. In addition, Job is mentioned in the New Testament of the Christian Bible: the Epistle of James James 5:11 paraphrases Job as an example of patience in suffering. Job's declaration, "I know that my redeemer liveth", Job 19:25 is considered by some Christians to be a proto-Christian reference to Christ as the Redeemer, and is the basis of several Christian hymns, as well as the opening scene of Part III of Handel's Messiah. However, Jewish bible commentators and scholars point out that Job "insists on a divine hearing in his lifetime", cf. Job 16:19–22. He is commemorated by the Lutheran Church–Missouri Synod in their Calendar of Saints on May 9, by the Roman Catholic Church on May 10 (pre-1969 calendar), and by the Eastern Orthodox Church on May 6. He is also commemorated by the Armenian Apostolic Church on May 6 and December 26, and by the Coptic Orthodox Church on April 27 and August 29. The Church of Jesus Christ of Latter-day Saints also affirms the existence of Job: "Thou art not yet as Job; thy friends do not contend against thee, neither charge thee with transgression, as they did Job" (D&C 121:10). Latter-day Saints hold in high esteem the life, example and righteousness of Job, and consider him a model of perseverance and endurance to the end. In the Qur'an, Job (Arabic: أيّوب‎, translit. Ayyūb) is considered a prophet in Islam. 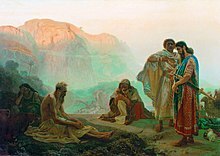 The narrative frame of Job's story in Islam is similar to the Hebrew Bible story but, in Islam, the emphasis is paid to Job remaining steadfast to God and there is no record of his bitterness or defiance, or mention of lengthy discussions with friends. Some Muslim commentators also spoke of Job as being the ancestor of the Romans. 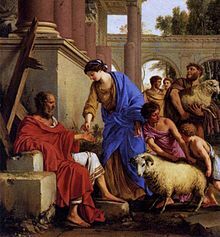 Muslim literature also comments on Job's time and place of prophecy, saying that he came after Joseph in the prophetic series and that he preached to his own people rather than being sent to a specified community. Tradition further recounts that Job will be the leader of the group of "those who patiently endured" in Heaven. Philip K. Hitti asserted that the subject was an Arab and the setting was Northern Arabia. The Qur'an mentions Job's narrative in a concise manner. Similar to the Hebrew Bible narrative, Islamic tradition mentions that Satan heard the angels of God speak of Job as being the most faithful man of his generation. Job, being a chosen prophet of God, would remain committed in daily prayer and would frequently call to God, thanking God for blessing him with abundant wealth and a large family. But Satan planned to turn the God-fearing Job away from God and wanted Job to fall into disbelief and corruption. Therefore, God allowed Satan to afflict Job with distress and intense illness and suffering, as God knew that Job would never turn away from his Lord. And Job, when he cried unto his Lord, (saying): Lo! Adversity afflicteth me, and Thou art Most Merciful of all who show mercy. The narrative goes on to state that after many years of suffering, God ordered Job to "Strike with thy foot!". At once, Job struck the ground with his foot and God caused a cool spring of water to gush forth from the Earth, from which Job could replenish himself. The Qur'an says that it was then that God removed his pain and suffering and He returned Job's family to him, blessed him with many generations of descendants and granted him great wealth. In addition to the brief descriptions of Job's narrative, the Qur'an further mentions Job twice in the lists of those whom God had given special guidance, wisdom and inspiration (IV: 163) and as one of the men who received authority, the Book and the gift of prophethood (VI:84). There are at least two locations that claim to be the place of Job's ordeal, and at least three that claim to have his tomb. The Eyüp Sultan Mosque in Istanbul, Turkey, holds the tomb of Abu Ayyub al-Ansari, a companion of Prophet Muhammad, not the Biblical/Qur'anic Job (Ayyub in Arabic, Eyüp in Turkish), though some locals tend to conflate the two. In Palestinian folk tradition, Job's place of trial is Al-Jura, or Al-Joura, a village outside the town of Al-Majdal (today's Ashkelon, Israel). It was there God rewarded him with a fountain of youth that removed whatever illnesses he had, and gave him back his youth. To the northwest of the depopulated Palestinian village of Dayr Ayyub is an area which, according to the village belief, contained the tomb of the prophet Ayyub, the Biblical Job. 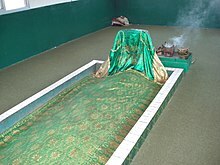 In the area of Tabgha (Greek: Heptapegon), on the shore of the Sea of Galilee, a few of sites are associated by local tradition with the life of Ayyub. A small grotto near the base of what is known to Christians as the Mount of Beatitudes, or Mount Eremos, is known as Mghraret Ayub ("Job's Cave"). Two of the towers built in the Byzantine period to collect the water of the Heptapegon springs are named in Arabic Tannur Ayub ("Job's Kiln") and Hammam Ayyub ("Job's Bath"). Hammam Ayyub was initially called "the Leper's Bath", but the leper was later identified with Job; the nearby spring, now a waterfall, is known as Ain Ayub, "Job's Spring". The town of al-Shaykh Saad in the Hauran region in Syria has been associated with Job since at least the 4th-century AD. Karnein was mentioned in Eusebius' Onomasticon as a town of Bashan that was said to be the location of the house of Job. Egeria the pilgrim relates that a church was built over the place in March or February 384 AD, and that the place was known as the "town of Job", or "civitas Job." According to Egeria's account the body of Job was laid in a stone coffin below the altar. According to tradition, Hammam Ayyub is a fountain in the town where Job washed himself when he was sick, and is reputed to have healing powers. Another holy artifact in the town is the "Rock of Job," known in local folklore as the place where he sat when he was afflicted with the disease. The city of Urfa (ancient Adma', later Edessa) in the Şanlıurfa Province, or Harran region of southeastern Turkey, also claims to be the location at which Job underwent his ordeal in a cave. The location boasts an Ottoman-style mosque and madrasa that runs as shops today. A well exists within the complex, said to be the one formed when he struck the ground with his foot as described in the Quran. The water is considered to be miraculously curing. The whole complex underwent recent restoration. The tomb of Job is located outside the city of Urfa. The Tomb of Job is also said to be situated in Jabal Qara outside the city of Salalah in southern Oman. Additionally, the Druze community also maintains a tomb for the Prophet Job in the El-Chouf mountain district in Lebanon. Venerable Job, 17. century Northern Russia. Job in the curing water, from a Persian illuminated manuscript version of Stories of the Prophets. "Job and His Friends," one of Gustave Doré's illustrations for La Grande Bible de Tours. "Job" (bronze, 1945), by Ivan Meštrović. Installed at Syracuse University, Syracuse, New York. ^ "JOB – In Rabbinical Literature". The unedited full-text of the 1906 Jewish Encyclopedia. JewishEncyclopedia.com. Retrieved 16 September 2013. ^ "Tablet of Patience, or Tablet of Job". bahai-library.com. Retrieved 2018-06-24. ^ "Iyyov – Job WEBSHAS Index to the Talmud". Aishdas.org. Retrieved 2012-04-06. ^ "Rabbi Yehudah Prero "The Passover Hagadah Maggid – Relating the Chain of Events Part 2"". Torah.org. Retrieved 2012-04-06. ^ Cf. "But I know that my Vindicator lives; In the end He will testify on earth – this , after my skin will have been peeled off." (Job, 19:25 Berlin, Adele; Brettler, Marc Zvi (2014). The Jewish Study Bible. [S.l. ]: Oxford University Press. p. 1523. ISBN 978-0-19-997846-5. Retrieved 2 January 2017. – Vindicator, Hebrew "go'el", a person, usually a relative, who stood up for his kinsman's rights; also used of God in his relationship with Israel. ^ Abdullah Yusuf Ali, The Holy Qur'an: Text, Translation and Commentary, note 2739: "Job (Ayub) was a prosperous man, with faith in Allah, living somewhere in the north-east corner of Arabia. He suffers from a number of calamities: his cattle are destroyed, his servants slain by the sword, and his family crushed under his roof. But he holds fast to his faith in Allah. As a further calamity he is covered with loathsome sores from head to foot. He loses his peace of mind, and he curses the day he was born. His false friends come and attribute his afflictions to sin. These "Job's comforters" are no comforters at all, and he further loses his balance of mind, but Allah recalls to him all His mercies, and he resumes his humility and gives up self-justification. He is restored to prosperity, with twice as much as he had before; his brethren and friends come back to him; he had a new family of seven sons and three fair daughters. He lived to a good old age, and saw four generations of descendants. All this is recorded in the Book of Job in the Old Testament. Of all the Hebrew writings, the Hebrew of this Book comes nearest to Arabic." ^ "Story of Job in Bible and Quran - Gohar Mukhtar's Weblog". goharmukhtar.wordpress.com. ^ The Archeology of the New Testament: The Life of Jesus and the Beginning of the Early Church (Revised edition (1609) ed.). Princeton, New Jersey: Princeton University Press. 1992. p. 87. ISBN 0-691-00220-7. Retrieved 26 July 2016. ^ Pringle, 1998, p. 239. ^ Schumacher; Oliphant; le Strange, 1886, p. 194. ^ Schumacher; Oliphant; le Strange, 1886, p.191. ^ "Tomb of Job near Salalah". www.usna.edu. Retrieved 2018-12-24. Wikimedia Commons has media related to Job. An international fraternal organization for young women based on the teachings of the book of Job. This page was last edited on 12 April 2019, at 17:30 (UTC).